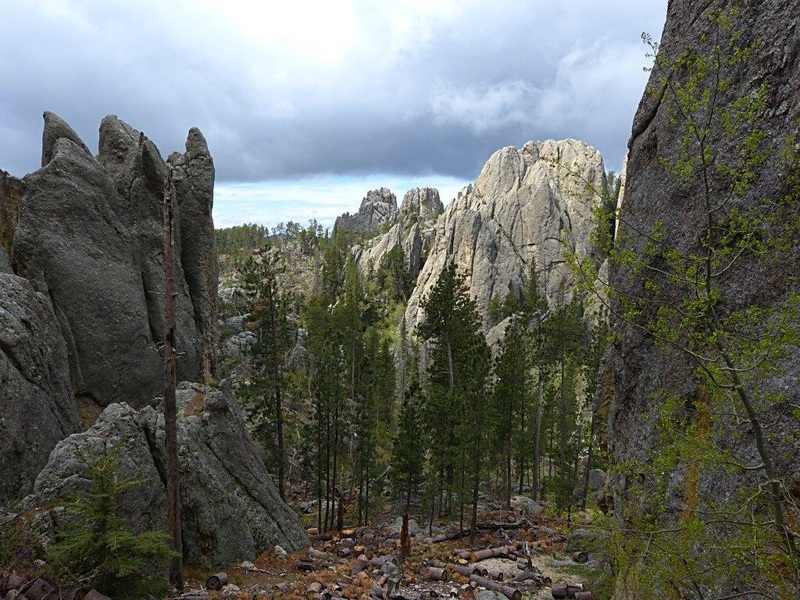 We caught some sunshine between rain clouds and drove the Needles Highway to the Sylvan Lake area of Custer State Park. The highway is only about 18 miles long, but the scenery is outstanding! The road traverses the high land and has two rather tight tunnels cut through the rock formations. The Needles Eye is adjacent to a tunnel and sits almost on the highway. It is the featured image for this post, but if you are driving the highway and watching the narrow switchbacks, it is easy to miss it! Once we arrived at Sylvan Lake we let Woolly Bear out of the car and set off on the easy hike around the lake. Dogs are allowed on the trails, but not on the swimming beaches. The lake water was high as South Dakota has had quite a bit of rain in the Black Hills area, so some of the trail was under water. After completing the easy mile long hike we continued on some of the other trails until Woolly began to tire. As those of you who follow this blog know, he had both knees operated on less than a year ago, and he is still not quite up to par. A mile or two is about all our exuberant Airedale can handle at one time. 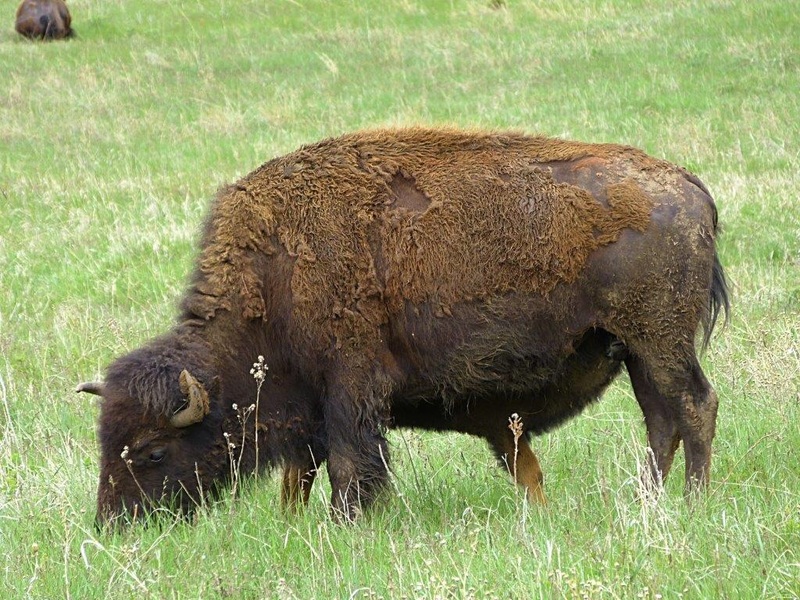 We decided to have a picnic on the Wildlife Loop watching the bison and the wild burros. Friday we drove the Iron Mountain Scenic Highway and visited Mt Rushmore in the morning. This highway consists of a series of pig tail log bridges, the road spirals up the mountain and has a series of circles, bridges, and narrow stone tunnels. There is one particular tunnel that gives you a look at Mt Rushmore as you exit it. We stopped at several look offs, let Woolly Bear stretch his legs, and reminisced about our time at Custer State Park and Mt Rushmore 30 years ago! We can’t figure out why it has taken us so long to visit again. Custer State Park is a very special place! 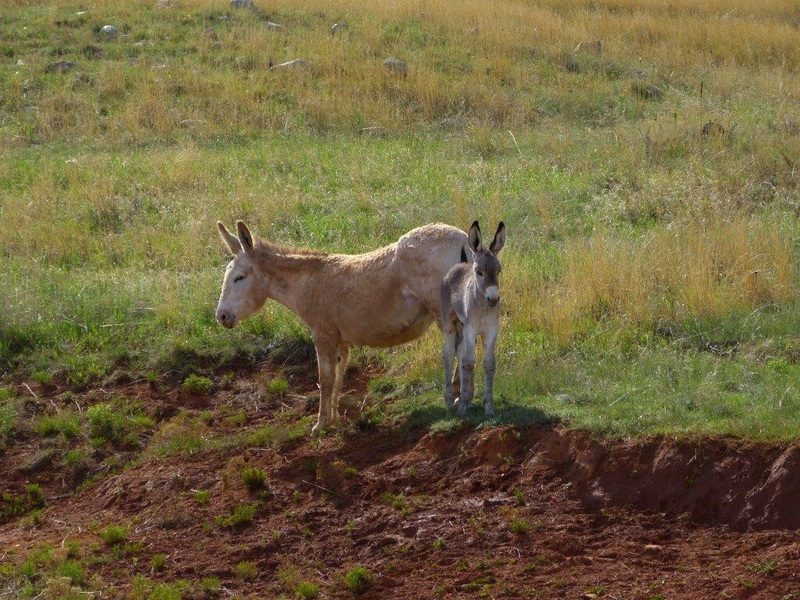 This entry was posted in Alaskan Road Trip, Black Hills, Custer State Park on May 29, 2015 by Ramblin' Rose. Hi Sara, Charlie and Woolly. Looks like you’re having a fantastic trip so far. Pictures and narrative are wonderful!!! Thanks Susie! I told Charlie you liked his pictures and it made him happy.